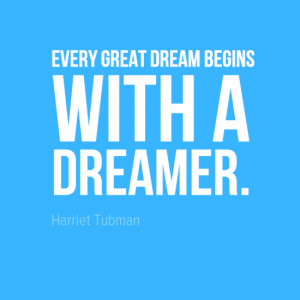 Are you a dreamer? 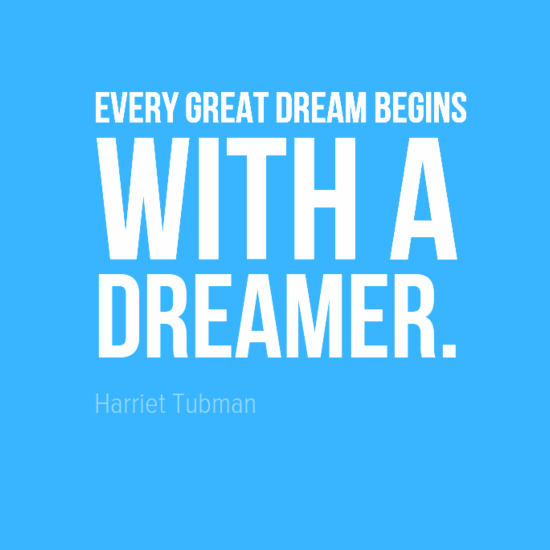 This week we provide a quote from African-American abolitionist, humanitarian and spy, Harriet Tubman. Harriet Tubman was born Araminta Ross to slave parents in approximately 1822 (she changed her name to Harriet Tubman following her marriage in approximately 1844). As with many slaves in the United States, neither the exact year nor place of her birth was recorded. Tubman was “owned” by a family who ran a large plantation in Maryland, United States. As a child she was beaten by the slave owners to whom she was hired out. In one such attack, she suffered a severe head wound that caused disabling epileptic-type seizures and headaches. In the fall of 1849, Tubman escaped to Philadelphia in the US state of Pennsylvania (Pennsylvania was at the time one of several free states in the US, having abolished slavery in 1780). Tubman soon returned to Maryland to rescue her family and slowly, one group at a time, brought relatives out of the state, and eventually guided dozens of other slaves to freedom. When the American Civil War began in 1861, Tubman worked for the Union Army, first as a cook and nurse, and then as an armed scout and spy. She became the first woman to lead an armed expedition in the war when she guided the Combahee River Raid that liberated more than 750 slaves in South Carolina. After the war, Tubman retired to the family home in Auburn, New York, where she cared for her aging parents and became active in the women’s suffrage movement in New York. Near the end of her life, she lived in a home for elderly African Americans that she had helped found years earlier. Tubman died in New York in 1913, aged 91. Since her death Tubman has been honoured for her actions in numerous ways. In 1944, the United States Maritime Commission launched the SS Harriet Tubman, its first Liberty ship ever named for a black woman. In 1978, the United States Postal Service issued a stamp in honor of Tubman as the first in a series honoring African Americans. In March 2013, President Barack Obama signed a proclamation creating Harriet Tubman Underground Railroad National Monument on the Eastern Shore and in 2002, scholar Molefi Kete Asante included Harriet Tubman on his list of the 100 Greatest African Americans.